If you are selling your home or condo you probably know that photos and virtual tours are extremely important to the presentation of your prized piece of real estate. A good virtual tour or photo set can make all the difference as buyers scour the Internet looking for a place to call home. Zipvo, a Boston-based startup, recently launched into beta to take this scenario to the next level with full video real estate listings. What do I mean? Think YouTube meets real estate listings. 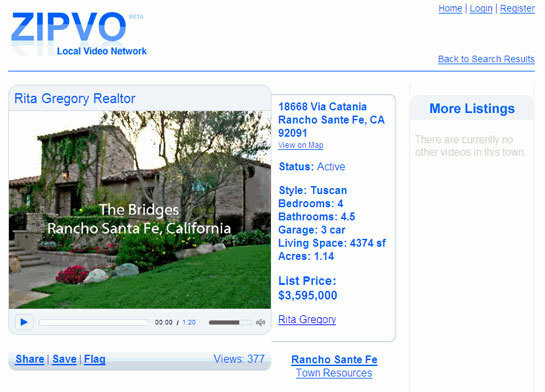 Zipvo is a FREE video real estate listing site. Similar to HotSwap a company that I previously highlighted that does automobile video listings, Zipvo has created a platform that makes it easy for anyone to upload a home video tour. Zipvo offers the ability to create a listing page with a video which can be shared or saved. Videos are embeddable, as well, which make your real estate listing a little more viral. Zipvo's free business model could end up being disruptive to pay-to-post real estate services which tend to charge customers extra to post video and virtual tours.